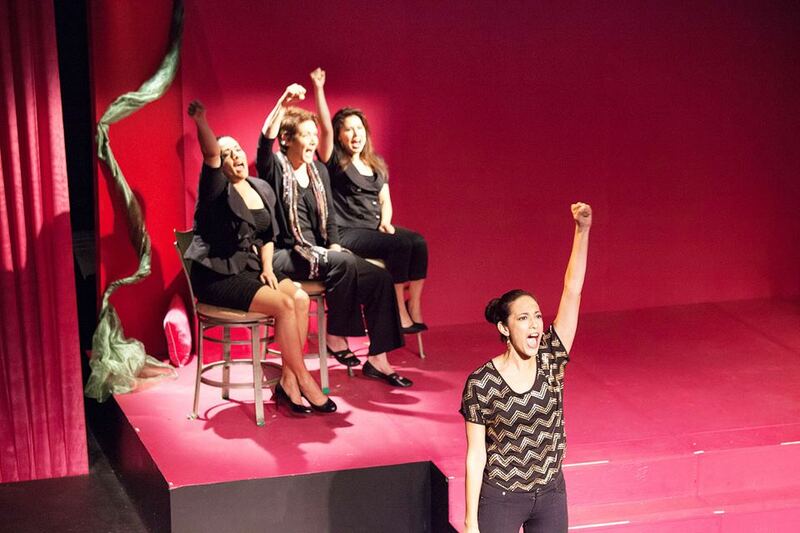 Coinciding with the release of a book—now out on Arte Público Press—that gathers the eight, award-winning monologues penned by eight Latina women, the reprisal of 8 Ways to Say I Love My Life at Casa 0101 is every bit as powerful as the original stage 2009 stage production. In many ways, the play is vastly improved. With each of the eight parts written independently by women who come from across the country and work across a broad professional spectrum, 8 Ways is a celebration of triumph, spiritual health and personal achievement. 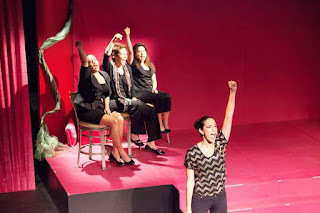 With a decidedly sharper and somewhat leaner script, as well as agile direction by Nancy De Los Santos Reza, 8 Ways has come into its own as a finely crafted stage production which moves it well beyond the realm of simple women’s empowerment or self-help. Noelle (l. to r.) in 8 Ways To Say I Love My Life! With an ensemble cast led by award-winning actor Yvonne De La Rosa, who interprets an Act I piece by Susan Orosco, an author and life coach and an Act II monologue by Josefina López, arguably the most produced Chicana playwright in the nation and one of the interdisciplinary visionaries behind the emerging Boyle Heights arts district. “Dear Oprah” and “My Low Self-Esteem Days” are, respectively, anchors insofar as DeLaRosa’s performances deliver an urgency that does not limit or diminish the effectiveness of the profound humor evident in both pieces. Actor Ivonne Coll, a newcomer to the Casa stage but no stranger to community-based, neighborhood theater as re-imagined and notched up significantly under the Casa 0101 mandate, brings a restrained and stately—even regal—power to Rita Mosqueda Marmolejo’s “Journey to Karoake,” a piece which ripples with the disappointment that comes with a child’s realization that her skin color is a hindrance to her artistic dreams, and in “To Have or Have Not,” authored by De Los Santos Reza, the most accomplished film and television writer in the group. Kikey Castillo appears first as the embodiment of Margo De Leon, a former Toastmaster’s club officer, in De Leon’s “Pillar of Strength” and then as a hopeful optimist in a piece entitled “Believing in Happiness” by Joanna Ilizaliturri Diaz. A petite performance dynamo, Castillo has collaborated with López for years in numerous and wide-ranging productions at Casa 0101. Of the three performers, she is thus the most at home here. That familiarity gives her characterizations a subtle authenticity that underscores the sadness and tragedy in both monologues and fuels the triumphant resolutions in both. The most exciting discovery in 8 Ways is Karina Noelle, an LA native who channels Bel Hernández Castillo a Chicano Movement empowered high school ballet folklorico dancer in “The Power to Say I Belong” and Laura De Anda’s sweet, poignant piece about a loving daughter who chronicles the deterioration of her father’s mental condition and simultaneously celebrates her mother’s subsequent resilience in “His Beautiful Mind, Her Beautiful Heart.” Noelle does the same kind of heavy lifting that her symbolic sisters do on stage, but there is a fresh tenderness to her mannerisms, voice, and movement. It is a reticent grace laced with sudden, almost ecstatic expressions of glee and optimism. Obviously, the material she was given to perform has a great deal to do with it. All four of the actors offer memorable turns in both of their roles. As such, it should be no surprise that, outside of the community, they have become well established Hollywood stars. They really do bring the heat. And 8 Ways is indicative of how, once they’ve learned to recognize their strength and power, nothing can stop them from generating that heat for themselves, for each other, and for audiences who now finally have the opportunity to see lasting truths about human relationships and our inner-selves that these stories reveal.